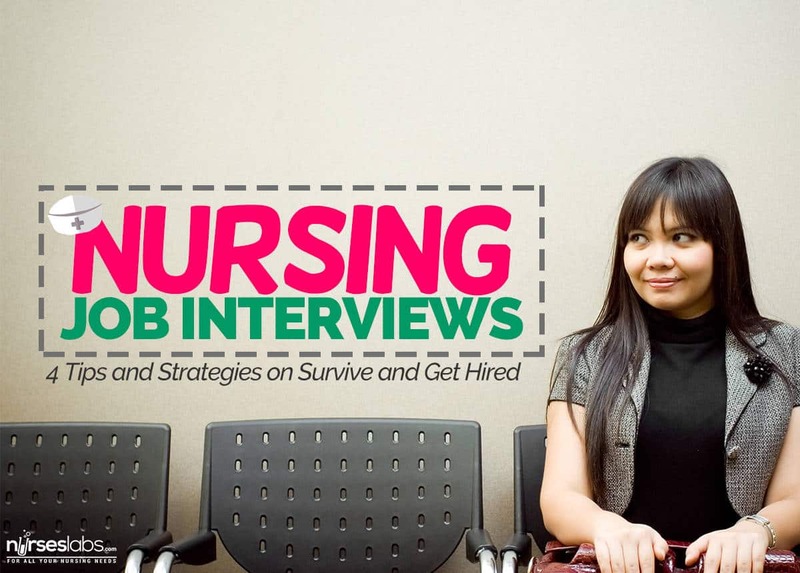 Nursing Job Interview: 4 Tips & Strategies to Get Hired! Let's help you get hired! Starting a career as a nurse requires dedication. How you prove that dedication is assessed in the interview process, which is why passing the interview is very vital. You have to convince the interviewer that you are in it to win it. The interview anxiety is never solely experienced by the fresh graduates applying for an entry level, but this is also felt by the veterans applying for a job who have been out of touch from the job hunting heist for the last five years or so. It is a general fact that the chances of a newbie at getting hired is tantamount to that of an expert level nurse, as how you present yourself is the primary requirement towards getting hired. Here are some nursing job interview tips and key points to remember before and during the actual interview itself that will give you a pass towards becoming an employed nurse. If you are a veteran, you can change the words for a bit, but generally, the company would want to know how driven you are to actually make a difference in the business. You have to think in the context of business this time, as the employer is risking an investment by hiring you. If your employment history is a red flag, be cautious and state the matter in a positive tone. You can say that your previous employment have made you realize what you really want to do with your life, and then associate why the company that you are applying for fits the criteria for you. You have to encourage the idea that you are now a changed person, and that the company will bring out the best in you. For the newbie, you can indicate that the role you are going to play in the company have matched your capabilities and interests, therefore creating an impression that you are perfect for the job. As much as possible, do not exaggerate, or make empty promises. It really helps to notice and enumerate the positive attributes of the company, and make them your reasons why you would want to stay long term. Do not tell them your truth that you are just going to stay for a short period of time. This is a job interview, not a lie detector test. Go back to the job description of the job that you are applying for, and relate your stories to their requirements. Emphasize past experiences where you gained a sense of fulfilment in overcoming the stressor. There are certain aspects in you that the employer is trying to find, and if you fit their culture, your chances at getting hired would be greater. It is fundamental that you relate past examples and stories that are in a way related to the job that you would want to have. Now this is a tricky subject because you have to formulate a way to turn your weakness into something that is beneficial. While you aim to impress, the nature of your weakness would automatically alter your chances at getting hired. You have to assess yourself, know your own strengths and weaknesses. Do tell as to how you can improve on your weaknesses, or you can use your strength as a compensatory mechanism for your weaknesses. 2. Be at the top of the food chain. Always remember that you are not the only applicant, so step up and beat the competition. Make it a point to remember that the interviewer is talking to four or five persons in a day, all vying for the position that you are applying for. To make an impressive version of yourself, be at your best. Always be punctual and think ahead of possible delays like traffic and weather disturbances. Dress to kill, professionally (although I was advised never to wear too much perfume). Smile and radiate a happy disposition. It is okay to be nervous, but how you handle your composure would actually leave an impression that you are boundless by any hesitancy and insecurity. And that, my friend, is how they will remember you. You will gain plus points if you can cite certain facts about the company’s profile. You don’t have to memorize the entire history of the company, but take the time to know their work culture, their reputation to the general public, their positive values, an overview of their developments, and even the salary scheme. You will be asked as to how these factors would affect your longevity in the company in case they hire you. 4. Prepare to ask a string of intelligent questions. This is the crucial part of the interview, as you can actually negotiate for your salary and map your professional growth in the company. But of course, if you are a newbie, we have this tendency to be coy. We lack the assertiveness to do so for the reason that we are still hatchlings in the industry. But it is always acceptable to ask for the company’s process of promotion, how often does the management do that, and what are the benefits and the company incentives given to the employees. This will secure a notion that you are bound for a long term career with the company. Technically, you have to prepare yourself some scripted answers, and by all means, rehearse them in front of a mirror (if you are not comfortable, then remove the mirror). But when all else fails, be honest about your experiences, match what you say to your resume, and do not confabulate stories. It would be hard for you to support your story along the way. Most of the time, the interview is the last frontier that you have to encounter in the job hiring process. After you pass the interview, it is either you are hired, or you are not. So always come prepared and stay strong. And keep in mind that the interviewer is just another human being, and you will do just fine.